Good Day everyone. Long time sins i made an Easel card. 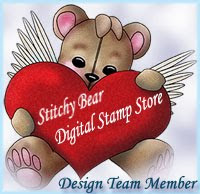 I love stamps by Elaine Cox from Sweet Pea Stamps, and this one just gorgeous "Bess". Lucky for you it can be in Rubber, or Digital image, so you don't have to wait for so long. OUTSTANDING, love your easel cards, love the layout for that gorgeous image which you have colored beautifully, looove that stunning bow, the flowers and sentiment holding the easel up is just fantastic, thanks for sharing..